George F. Walker’s latest play, Dead Metaphor, had its world premiere at the American Conservator Theater in San Francisco in March last year. Although the country where the action is set is never mentioned, it is clearly the USA, given the problems characters face in paying for health care, and specifically in California, since they mention living on a “fault line”. One of the characters, a politician, has intentionally skewed her campaign to appeal to the extreme fringe of the right wing that is against big government, against welfare, against gays, against abortion and against regulations on banks or corporations. Though the words are never mentioned, it’s obvious that Walker is referring to the Tea Party movement. There are three basic problems with writing a play to satirize the Tea Party (or any Tea Party-like groups). First, given Walker’s skills as a satirist, it is far too easy a target that has already been done to death by late-night comics. Satirizing the Tea Party in the theatre is basically preaching to the choir. Second, the Tea Party is one of those groups that pop up occasionally where truth is stranger than fiction. The best way to satirize such groups is simply to quote the outrageous statements their leaders make as has been the method of The Daily Show and The Colbert Report. Third, what might have seemed fresh in March 2013 is already dated in May 2014. The current news is about the massive defeat of the Tea Party in the US midterm elections. The danger in writing an up-to-the-minute satire like this is that the minute passes. The action of Walker’s crypto-American play concerns Dean Trusk (Noah Reid) an army sniper in Afghanistan who is now struggling to find work back home. None of his job interviews have led to employment so he seeks help from a job counsellor Oliver Denny (Michael Healy), a member of his parents’ church. Dean’s need for money is urgent since his ex-wife Jenny (Haley McGee) is pregnant. Jenny divorced Dean when he was serving in Afghanistan for the implausible reason that she did not want to be a war widow. Now that Dean is back, they play to remarry. Dean also needs money because his father Hank (Eric Peterson) has an inoperable brain tumour which is squeezing his brain and causing him to lose his memory and his inhibitions about speaking what he thinks in the crudest terms. In Walker’s country-which-is-not-Canada, Dean and his mother Frannie (Nancy Beatty) worry about how they can afford to find a place to care for Hank. Oliver eventually does find Dean a job as the personal assistant to his wife Helen (Julie Stewart), running as the Tea Party-like candidate. His position becomes precarious when a church representative hands Dean a briefcase full of money donated illegally from the church. Both Oliver and Hank becomes appalled that Helen has sunk so low. Oliver, in fact, thinks that Helen should be eliminated for the good of the country and hires Dean, to kill her. Dean tells Helen and a bidding war begins between the two spouses for Dean’s services in wiping out the other. With this development the plot becomes so far-fetched as to lose all credibility, and even satire has to be credible to be effective. Oliver tells Dean he has so much dirt on Helen he could easily ruin her campaign. Well, if that is so, why not save $100,000 and simply ruin her campaign and her political future? Meanwhile, Helen do not merely want to silence Oliver but, even more incredibly, get rid of her tree-hugging daughter. Walker obviously wants to make the point that military training gives people skills, like killing other people, that have no place in the civilian world. Walker wants to criticize the hypocrisy of a country that asks men to risk their lives but gives them no help when they return. His plot, however, is nonsensical since who will the police look for first when a person is killed by a sniper but the sniper that the deceased knows? To top everything off, Walker provides the most unsatisfying conclusion that this play could possibly have. Walker writes in short snappy scenes as if each were a separate bit of sketch comedy rather than part of a play. There are several occasions when Walker could take more than a cartoonish view of his characters, as in the relation between Frannie or Dean and the dying Hank. Yet each time Walker gets close to any emotion other than anger, he swerves away from it as quickly as possible creating a show that is unbelievable, superficial and repetitive. Before the play switches into its sniper-for-hire fantasy, it can be quite funny in observing the awkwardness of job interviews or of Frannie’s having to cope with Hank’s profanity-laced outbursts. Yet, Walker relies too heavily on forced quid pro quos and unexpectedly gross imagery to get cheap laughs. Despite all this the play is well cast and, given that the characters are caricatures, well acted. Noah Reid is very sympathetic as Dean. He well conveys the disorientation of a young man confused by the vicious pettiness of civilian life after having lived trough the life and death situations of war. As Hank, Eric Peterson puts in an excellent performance as an old geezer who can’t help expressing his innermost thoughts in cheerfully blue language. He uses the few reflective moments Walker gives Hank to try to lend the character a modicum of depth. Nancy Beatty is so good as his wife Frannie, struggling to put a calm face on tragedy, that you wish Walker would allow Frannie and Hank more serious moments together. Michael Healy is very funny as the ineffectual Oliver, uptight in his work and henpecked in his private life. As Helen, Julie Stewart starts out so big she gives herself nowhere to go. She does do a great viperous caricature of a Tea Party politician, but it is as out of character for Helen to do something so risky as taking out a contract on her husband as it is for him to take one out on her. Dean’s wife Jenny is completely underdeveloped. She appears because Walker needs her to appear, but he doesn’t have a clue what to do with her. He gives her several scenes on the phone to her lascivious mother who lives in a trailer park. These are likely meant be funny but never work mostly because they don’t move the plot forward or usefully fill in the character’s background. Haley McGee does her best but can’t make something out of nothing. The show is miked, which one would think unnecessary for a theatre seating only 700. On opening night the sound technicians were remarkably inept, usually switching actors’ mics on after they had already begun speaking and switching them off before the actors had finished. The show plays like a cable sitcom with the frequent blackouts feeling as if they were placeholders for commercials. Walker has written much better plays than this. 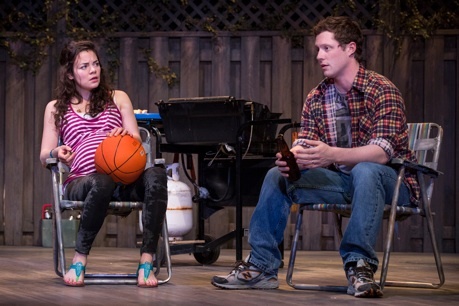 For such a left-leaning Canadian playwright, Dead Metaphor feels very much like a would-be American commercial product and his nine years of writing for television reveals itself in the play’s relentless superficiality. Let’s hope Walker can get back soon to the brilliance of the best of his “Suburban Motel” series. Photos: (from top) Nancy Beatty, Julie Stewart, Eric Peterson and Michael Healey; Haley McGee and Noah Reid. ©2014 Cylla von Tiedemann.